Whispering, the graduate student smiled. “Have a great summer!” She said eagerly, collecting my exam and stepping aside so I could pass to leave the room. I’d known then, as I was handing her the small stack of papers that comprised my final exam, that this was the end of my fourth semester at MSU. I’d known that this week was coming for some time. But to finally hear it – from the mouth of an instructor – was a little bit of a shock. I left the room with her last lesson neatly stashed in my mind, my hoodie zipped and my head buzzing. Her last “instruction” caused an epiphany which lead me to realize just how important this last year has been. I feel like I just moved into this apartment. It’s almost impossible to believe that I’ll be packing it up over the next few days and moving out shortly thereafter. I’m relieved that all the stressful classes I’ve had this semester are finally, actually, drawing to a close, but I am so sad to see what’s become normalcy change so drastically. I hate writing posts like this, particularly because I feel like stuff like this happens pretty frequently considering my situation with school (new semesters & new living quarters are quite commonplace, after all), but this year has really been a big deal for me. Freshman year was absolutely life-changing, but this year seems like it was more significant. It was less of a “transitioning into the real world” kind of year and more of a “well, here it is. Now what?” deal. Because of the differences, I think it goes without saying that I’ve grown a lot. For starters, I’ve got more confidence now than I’ve ever had before. I’m not afraid to talk to strangers, I’ve asked cute boys for their phone numbers (GIRL POWER!) and I’ve come to understand that people aren’t inherently inclined to dislike anyone which is something I’ve learned to use to my advantage. I’ve met and become close to some seriously awesome people this year and I am so, so, so happy and very thankful to have had the opportunity to do so. I even feel that I’ve become closer to my family, despite the distance, just because I know that they support me and the person I’m becoming 100% of the time. I’ve learned to eat more healthfully thanks to my friends, which is a big deal to me. Sure, I eat stuff that’s bad for me (have you seen my blog? ), but I appreciate simple foods like eggs, cottage cheese, fruits, vegetables and oatmeal more now than I ever could before. Plus, that stuff’s all got the benefit of being cheap and delicious, which leaves my wallet not-so-empty and my stomach full. Score. I could sit here and continue discussing the more minute changed I’ve gone through, but I don’t want to sound preech-y or full of myself. I think personal growth has become the underlying theme to my blog and, in a way, it seems kind of selfish to speak about myself so frequently. But, at the same time, I really like having this as a resource for reflecting on memories and events from different stages in my life. I know I don’t have a particularly interesting life, so I hope you guys don’t mind it too much! 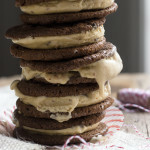 I chose to go with ice cream sandwiches for this post because they remind me of sitting on the porch in the summer, looking back and watching the world go by. I’ve been in that kind of mood lately. I’ll be back here soon enough. I was worried that the florentines wouldn’t hold up as ice cream sandwich cookies, but they work really well! They’re very loud and crunchy when frozen though – so be careful if you’ve got sensitive teeth. Makes about 1 dozen sandwiches – with extra florentines. Preheat the oven to 350F and prepare 2 parchment lined baking sheets. Have a 3″ cookie cutter on standby. Chop the pecans and cocoa nibs until no large pieces remain (go for nerd-sized chunks, according to Stella!). Add the flour and cocoa and set aside. In a medium pot, combine the butter and honey over medium heat, stirring frequently until melted. Add the sugar, salt, and espresso powder, then bring to a boil, stirring occasionally to ensure that the sugar dissolves. Once it begins to boil, remove from heat and add the vanilla and dry ingredients, mixing just to combine. 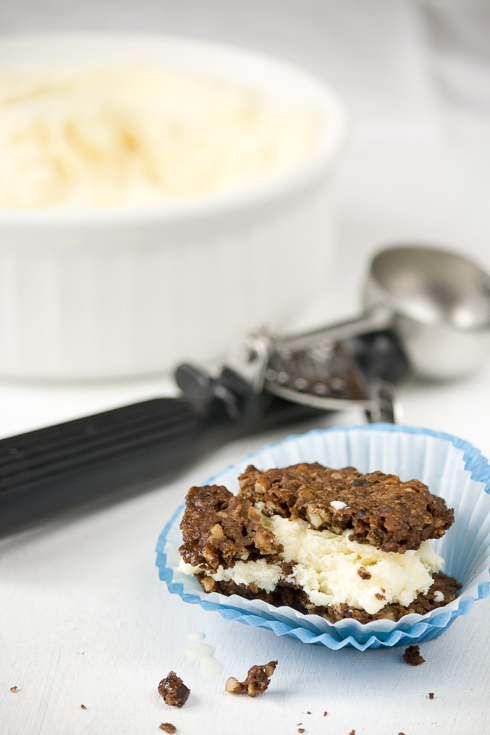 Use a small ice cream scoop or tablespoon to portions the dough. Drop onto the lined baking sheets, leave about 4” between each cookie – these guys spread! Bake 13-15 minutes or until they’ve spread and are dark and lacy. Remove the cookies from the oven and allow them to cool on the pan for about a minute, then use a 3″ cutter to stamp perforations into the soft cookies. Don’t try to cut – just make a good indentation. Allow the cookies to cool completely. 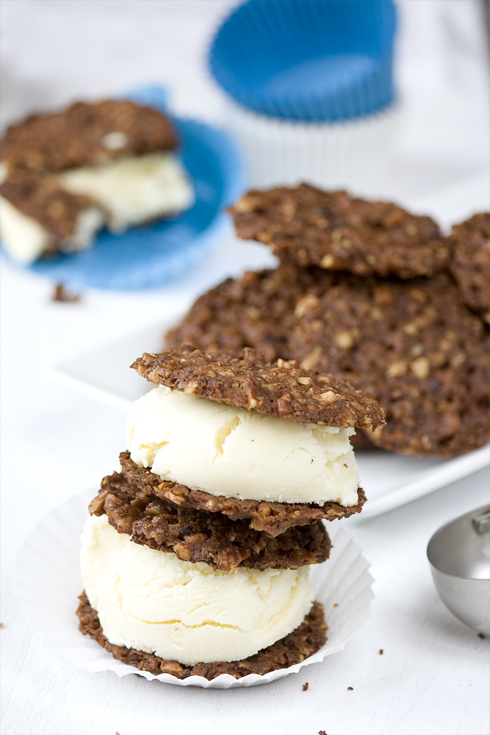 Once cooled, break the excess off of each cookie. 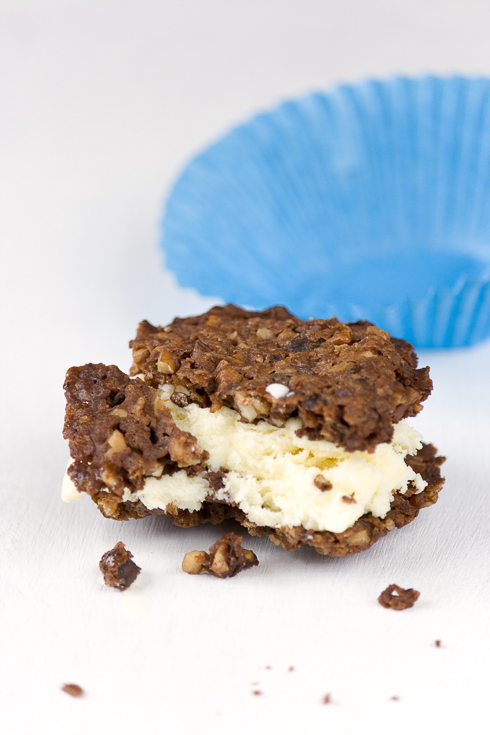 Reserve the crumbs for another use (I suggest eating them with peanut butter and banana on toast). Place the egg yolks and 1/4 c of sugar in a medium-sized heat-proof bowl and whisk until ribbons form when the whisk is lifted from the bowl. Set aside. Heat milk, cream and remaining 1/8 c sugar in a medium saucepan over medium heat. Bring to a boil and pour about 1/3 of the hot mixture into the yolks, whisking constantly to temper. Pour the tempered yolks back into the pan and continue cooking over medium heat, whisking constantly, until thickened. Pour cooked custard into a bowl and press a sheet of plastic wrap to the surface. Chill overnight and then freeze according to your manufacturer’s directions. Gourgeous idea. Great for all the beautiful weather we&#39;ve been having lately too! Oh. MY. GOD. I made these florentines a while ago and absolutely fell in love with them. 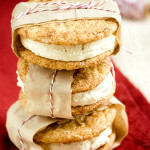 I can see how perfect they are for ice cream sandwiches. You are too clever! Love this post! I love to hear all about how you&#39;re growing. I remember the &quot;so accomplished — SO SAD&quot; feeing of the end of each year &lt;3 Thanks for sharing in such a lovely way! One question well 2 rolled into one .. what are Cocoa Nibs and where can I buy them? That looks wonderful. I love the recipe. Kailtin, great post. Remind me that no matter at which stage of life, it&#39;s important to stop for a sec and reflect on what you&#39;ve done and accomplished. It helps you to move on. 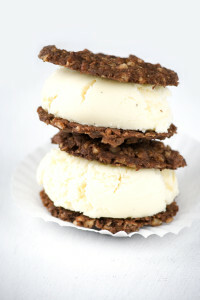 <br /><br />Also, your ice cream sandwich looks heavenly! This is such a lovely post. I am going through this same transition and I know exactly what you are feeling. It&#39;s rather bittersweet in the sense that another chapter has passed yet another is soon coming. 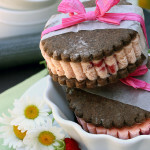 Thank you for the delicious ice cream sandwiches I cannot wait to make them myself and enjoy them on a sunny afternoon! Looks great and so crunchy! wow those look amazing! congrats on a successful semester! Thanks so much for the great comments, guys! You rock! <br /><br /><b>Colleen</b>, Cocoa nibs are bits of the outer hull of cocoa beans. They&#39;re super chocolaty and a little bit bitter. So yummy! I usually buy mine at a local co-op, but you can get them from the Scharffen Berger website as well.<br /><br /><b>Xinmei</b>, thanks so much! We&#39;re right at the same point in our schooling. YUM, YUM, YUM! I know what I&#39;m definitely going to need to try whipping up soon. I just found your blog, and I&#39;m a new follower 🙂 Happy Tuesday!